After two recent incidents concerns have risen about the 000 service. When Joe Scott's microlight crashed, David (in the following microlight) was unable to get the 000 operator to understand where he was, probably she couldn't spell Tyagarah, but certainly wasn't familiar enough with the area to understand where on the beach he was. During the cows-on-the-highway incident, the motorist who called 000 was hung up on after trying to get the operator to understand it was near Mullumbimby, not Murwillumbah. Apparantly we aren't the only people with strong concerns about calls being handled by people with no local knowledge at all. The mastif at the corner of Grays Lane and the Highway has threatened a couple of people recently (biking and walking). The survey is now closed, we aren't sure how many responded and its now in Council's court. As you probably have heard by now, there has been a fatal air crash over Tyagarah. An ultralight piloted by Joe Scott, with a visitor passenger came down in the bush just near the beach, Joe and the passenger were both killed. David was piloting a second ultralight nearby, he landed and called for help, but it appears that both people were killed in the crash. 3: Preference for dual-bin (one for trash, one recycling) or split-bin system. 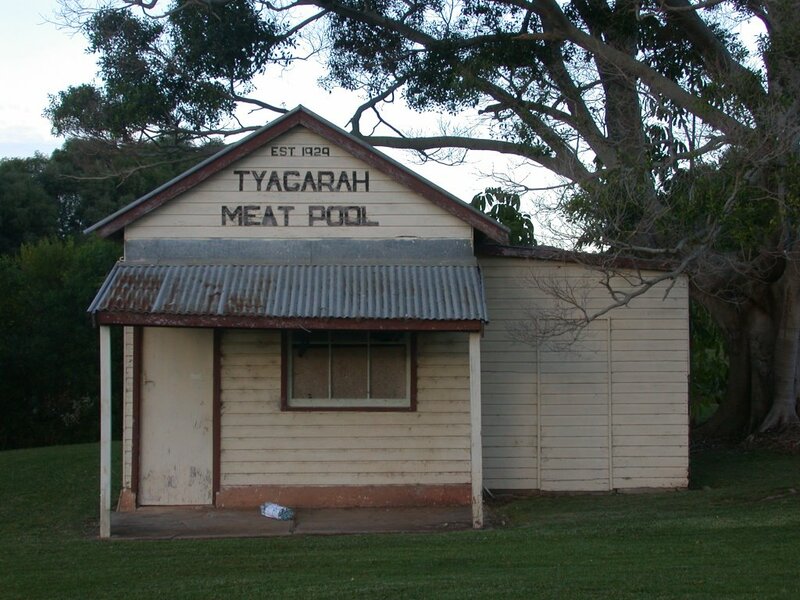 Continue reading "Rubbish Collection (East Tyagarah)"
Local historian Ron 'Tigger' Smith has written a book called Tyagarah Meat Pool - A Community History. Ron's book records the period 1927 - 1943 when the meat pool was a centre of community interaction. The pool attracted residents from all over the district, especially youngsters in search of a refreshing swim. Ron Smith spent two years compiling the book. 'The best part was interviewing the old-timers,' he says, 'who had lots of tales about the meat pool and other aspects of the rural community. The offer of Bruce's ute is no longer available. There do not appear to be any community actions on this at the moment other than those actions people are taking individually. females. There also was a punchup. 2002, at Mitra's house, Lotus Ponds, Gondwana, Prestons Lane. Please bring a plate / drink. with the association, or just wants to meet their neighbors is welcome. Joel will form a mini-working group to see if something can be worked out. Gyan and Eric were volunteered. There was not time to go into this in detail, Bruce has offered use of an old ute of his to carry a tank and be available for fire fighting. Discussions are under way around where to park it, and how to provide access. Bruce brought up the issue of fire safety and preparedness, he will be organizing a meeting (in conjunction with Amit) for Preston's Lane, and will be contacting people in other areas to encourage them to organize their own meetings. Different ideas were suggested, including trying to obtain hoses and getting the appropriate training from the Mullumbimby Bush Fire Brigade so that we could fight bush fires ourselves in the critical time while we wait for the Fire brigade to arrive. It was also suggested that if we had equipment and training then we should coordinate with the other parts of Tyagarah so that in the case of a fire in one area they could call on the other areas to turn out people. This will be an ongoing project but carried out with some urgency given the imminence of a probably severe fire season. Tony asked if anything could be done about the noise from the Rifle Range, decision made for Tony to contact Club initially then return for a vote on the matter. There was some concern about the noise from the shotgun club, if anyone else is bothered by this please email me, and I'll connect you with other people concerned.